- Text reads: "Blessed Be" in an Old English font. For wiccans and pagans, the phrase "Blessed Be" is a way to wish good fortune and abundant blessings for someone, much like "God bless you" is used by Christians. The phrase is often used as a greeting and/or goodbye. This bumper sticker is a subtle way to proclaim your pagan identity to others. 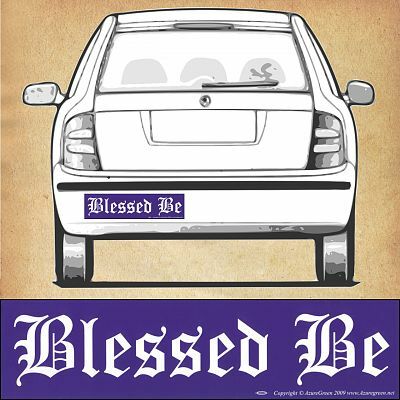 "Blessed Be" bumper sticker measures 11 1/2" by 3". This high quality vinyl decal is resistant to UV and water, and is made to last. Do you have any other questions about our "Blessed Be" Bumper Sticker?